The moon has long been associated with fantasy and mythology; and throughout history there has been stories told about it, with numerous individuals connected with it. Even relatively recently many people believed there was a “man in the moon”, and further back to Ancient Greece, there was a goddess associated with it, the Greek goddess Selene. Selene was the Greek personification of the moon. ​According to Hesiod, in the Theogony, Selene was a second generation Titan, a daughter of the Titan deities, Hyperion and Theia. Hyperion was the Titan god of light, whilst Theia, was the Greek goddess of sight, and so it was in keeping that the three children of this pair were, Helios, the sun, Eos, the dawn, and Selene, the moon. The sun and the moon are the most prominent features of the sky, and with the moon once thought to have its own light source, the siblings, Helios and Selene, go well together. 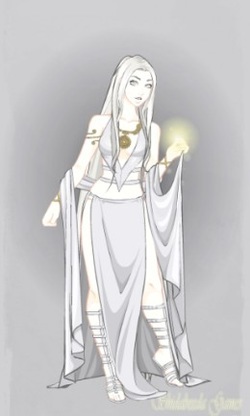 Selene, like most Greek gods and goddesses, had a Roman mythological equivalent, the goddess Luna. In Greek mythology, Selene was traditionally depicted as a beautiful young woman, with perhaps paler than usual skin. Upon the head of Selene was normally found a crown that was representative of the spherical moon. In antiquity, Selene would also often be depicted either riding upon a bull, or upon a silvery chariot drawn by two winged horses. This chariot was used by the Greek goddess of the moon, when each night she would traverse the sky, just as her brother Helios did during the day. In Ancient Greece, the moon was relatively important, for the passage of time would be measured by it; the Ancient Greek months being made up of 3 ten day periods based on the phases of the moons. The moon was also thought to bring forth the dew needed to nourish plants and animals. Selene was not the most prominent goddess of the Greek pantheon, and others female figures from Greek mythology were often talked of in relation to the moon, rather than Selene, with Hecate, Artemis and Hera prominent amongst these alternatives. Selene though, is prominent in one particular story from Greek mythology, the story of Selene and Endymion. In one version of the Endymion myth, the central figure was a shepherd, but a shepherd with virtually unmatched beauty, for Endymion was comparable in looks to Ganymede or Narcissus. Working as a shepherd, Endymion would often be found tending his flocks at night, and so the beauty of the mortal was observed by Selene in her nightly passage. Taken by the beauty of the shepherd, Selene fell in love, and would long to spend eternity with Endymion. Selene though was immortal, whilst Endymion would age and die. Zeus had no desire to make Endymion immortal in the traditional sense, but instead came up with a solution where the shepherd would not age or die, and enlisting the help of Hypnos, Endymion was placed into an eternal sleep. Thereafter, Endymion would sleep in a cave upon Mount Latmos, a cave which Selene would visit every night. 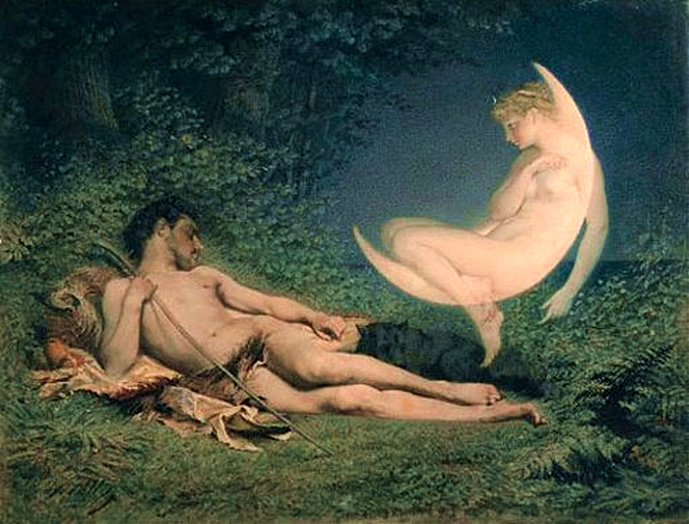 Endymion would sleep with his eyes open, so that he too could gaze upon his lover. The unusual relationship between Endymion and Selene would bring forth offspring for the pair, with the Greek goddess of the Moon, giving birth to the Menai, the 50 goddesses of the lunar months. There were 50 Menai, for there were 50 lunar months between Olympic Games. Endymion though was not Selene’s only lover, for the goddess of the Moon would have other children. Some writers in antiquity would write of the four Horai, the four seasons, being born to Selene after a relationship with Helios; whilst with Zeus she might be mother to Pandeia, the beautiful goddess of the full moon, Ersa, the goddess of morning dew, and Nemea, the nymph of a Nemean spring. Selene may also have given birth to a mortal son, although no father is named, this son being Mousaios, the legendary poet often connected with Orpheus.